I am not sure what future fix the thread (RTM Bug of PowerPivot on Excel 2013 64) was referring to. But the described behavior was an intentional design decision made by the Excel team. The underlying rationale was that an Excel table can be used in more places than just as a PowerPivot linked table, therefore users should see a consistent name (the name of the Excel table) throughout Excel. If PowerPivot renames an Excel linked table, the new name is only visible inside PowerPivot, but not inside Excel. 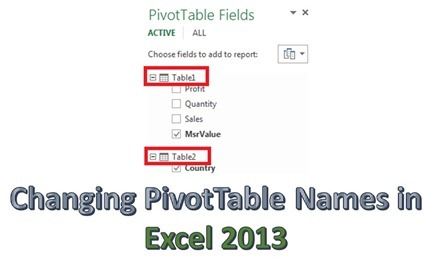 This can be very confusing to users of both Excel and PowerPivot, so users should stop renaming linked tables in PowerPivot, instead they should rename them directly inside Excel and let PowerPivot pick up the Excel table name. Agreed Jeffrey, but this can be really confusing for people who are upgrading their PowerPivot models from Excel 2010 to 2013 and are currently not renaming the linked tables in 2010. In the field list for 2010, we still see the name that we gave in the PowerPivot model (and not the linked table name) but suddenly this changes to the linked table name in the field list for 2013. If this is not going to be fixed, I guess we should always follow the rule to rename the linked tables before importing to PowerPivot data model.